September 20, 2012 By Seth R. Nadel & filed under All Articles, Shelter, Survival. 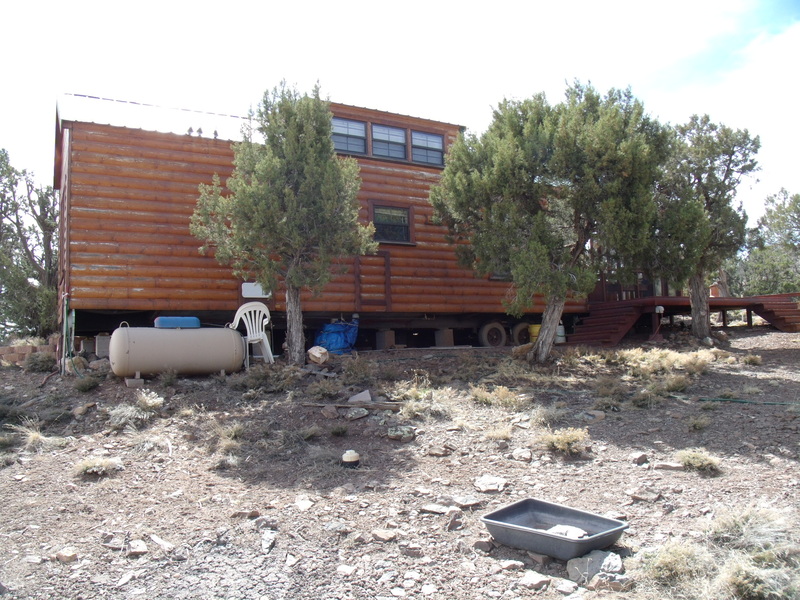 I have previously written about living off the grid, looking at the high-end permanent home/cabin situation (OFF THE GRID FULL TIME: Self-Sufficiency Without Tears, May 2012 S.W.A.T.). That was the ideal situation, but beyond the reach or desires of many. Now we’ll take a look at what the average person can do with a limited budget and time for a remote hideaway. The three critical elements of water, power, and sewage disposal are ever-present. And location is always the deciding factor—no matter what other choices you make, a bad location will result in problems from flood, fire, or the wrong neighbors. The other factor is the anticipated duration of the disaster. Storms can last days, fires for weeks, and man-made disasters can be short or long term. You must also factor in the time of year. Spring and summer events can be a lot easier to endure than fall and winter problems. Park unit, wheels still attached, ready for immediate occupancy. Starting just a step below the site built or modular home is the pre-fab “park unit.” These are complete small homes, originally intended for folks who live in a motor home to have a more permanent setup. All the ones I have seen have three critical elements: a place to store and cook food, a bathroom and a place to sleep. Some have luxury appointments such as big-screen TVs and hot tubs. Some folks have bought a park unit and put it on their property with the water/power/sewer systems, and enjoy using them for casual vacations or as their hideaway if the world turns sour. While they are still pricey, they are complete and ready to live in. 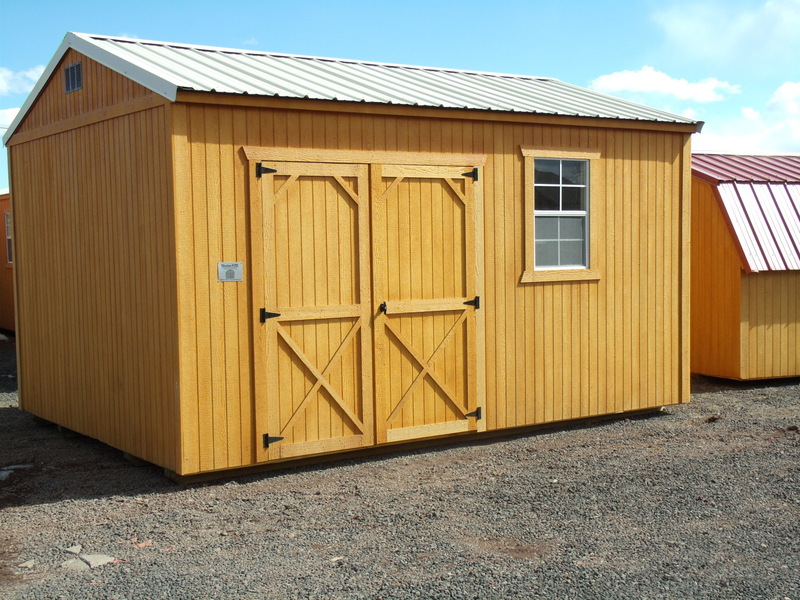 Modern shed is ready for delivery and your personalized build-out. This is one of many variants of sheds now available. A major step down in price are the new shed/cabins. These are well-made shells—you insulate them and run in the water/power/sewer where you want it. If you have the skills, you can turn one into a very comfortable cabin. One of the best things about them is they are rent-to-own, so you can get one delivered to your site immediately and camp in it while you fix it to your liking and pay for it. 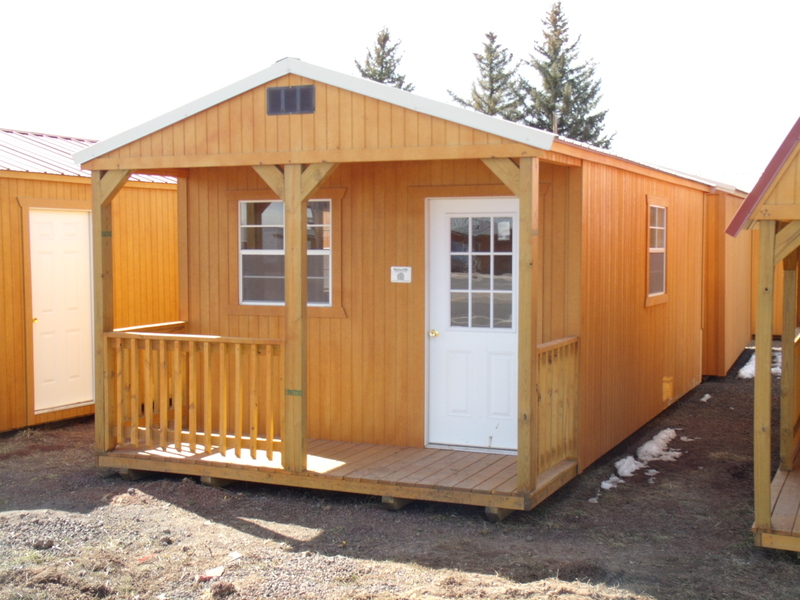 They have much more style than a mere shed, at much less initial cost than a park unit. You get more control of your budget, advancing the project as time and money allow. Stylish shed to be completed as your getaway place. Speaking of camping, let me dispense with one method—tent camping. I know some folks who tried to live in a tent while their house was being built. First coyotes took the family cats and dog. Then wind and rain destroyed their first tents. They bought replacement tents, but the high winds blew them out of state in a few weeks. They ended up moving into a site-built shed on their property just to get out of the weather. They were city folk who had not done their research. The typical nylon backpacking/camping tent is simply not made to endure long-term use with kids and pets. If they had spent a lot more, bought outfitter or G.I. surplus canvas tents and had them properly erected, they might have had a better outcome. But if you think you’ll be able to outlive a disaster in a typical nylon tent, good luck to you. Mobile home tucked away in the trees, ready for what may lie ahead. The best compromise from the standpoints of utility and cost may be a travel trailer. If the world as we know it does not come to a violent end (or until it does), a travel trailer can make a comfortable place to vacation or a less expensive place to stay while attending a training school or shooting event. They range from the spartan to extreme luxury models with big-screen TVs and wet bars. They are usually completely equipped with the necessities of bathroom, place to cook food, and place (or places) to sleep. For short-term living, they can be very nice. 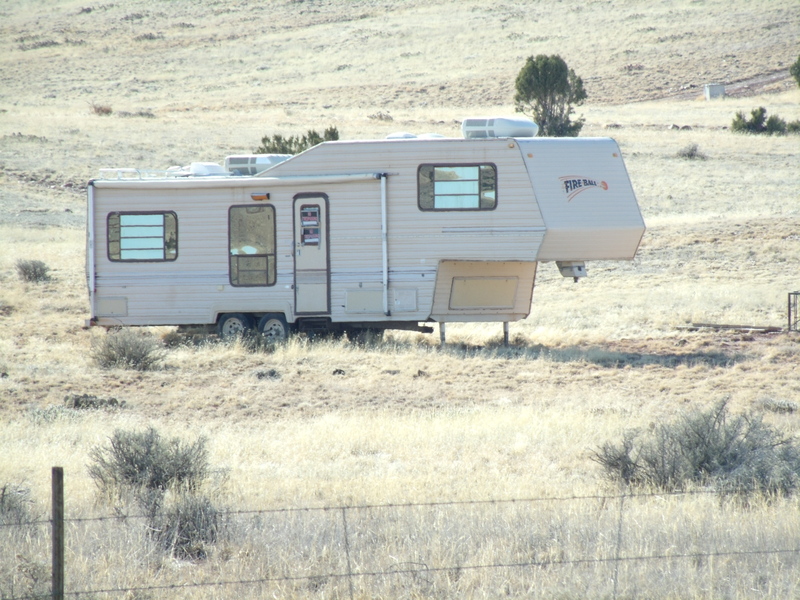 Travel trailers may be self-contained or need to be in a trailer park. Even the self-contained models carry limited amounts of propane and water and have small holding tanks for “used water.” And there never seems to be enough storage, even though a modern trailer strives to use every inch of space. My rule of thumb when I have rented them is if they say it sleeps six people, my wife and I will be comfortable in it. We don’t like having to take the table apart to make a bed or sleeping in small bunk beds. Most trailers are set up for park use, where they plug in for water/power/sewer. Of course, if there is a major disruption of society, natural or man-made, the water and power will stop. And some folks who live in trailer parks make you a loser in the game of neighbor roulette. O’dark-thirty in the middle of a storm is no time to be pulling in to an unknown park only to find out all your new neighbors are dopers and tweakers. But you would have the option of hooking your trailer to your vehicle and moving on, perhaps even out of the area. If the disaster du jour is a wildfire or storm, moving out of the affected area could be the very best thing to do. 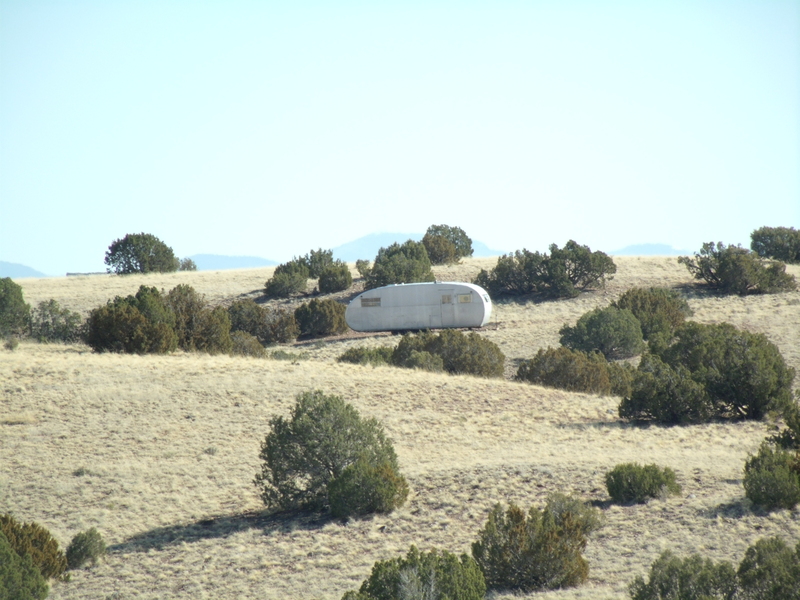 Older trailer tucked in behind a ridge. It’s still usable as a shelter. One of the downsides of travel trailers in our context of surviving a disaster is their relative fragility. I have been in one that the owner hardened, adding multiple gun safes and hard points. But a strong gust of wind or an outlaw with an axe will simply take a trailer apart. I saw a wrecking crew turn a large-sized trailer into pieces that would fit into a dump truck in one hour—with hand tools! And western interstate highways often report closures due to travel trailers (or parts of mobile homes) blown over and totaled due to high winds. Travel trailers can also run afoul of winter storms—you could have the ideal plan negated by a few inches of snow. On the other hand, prices, even for new trailers, are down—way down. And there are some real bargains on gently used units. Some shrewd shopping can get you what you want and satisfy your significant other that it will be great for vacations. I don’t recommend motor homes because of the additional expense of a separate engine and transmission. And you still need another vehicle because you don’t want to move your home every time you want to see what’s over the next hill or if the town has any bread. Large trailer is stored in the open for security but can be easily moved to a less conspicuous spot. Even with a trailer, you still need a place to put it! Here in the Southwest, raw (undeveloped) land is sold in 40s—meaning 40-acre parcels. Depending on easements, they are usually only 36 to 38 acres. Many are available that already have septic systems, and in some cases even wells. Prices are way down on land as well. Every year, rural counties auction off land for back taxes. Some friends got an undeveloped 40 for $300 in back taxes, as a buffer for their own land—a solution to the neighbor roulette I mentioned. A common scheme for developing a home in my area is a progression: buy the land and move a trailer onto it. As money allows, install a septic system, then drill a well and install a solar system. 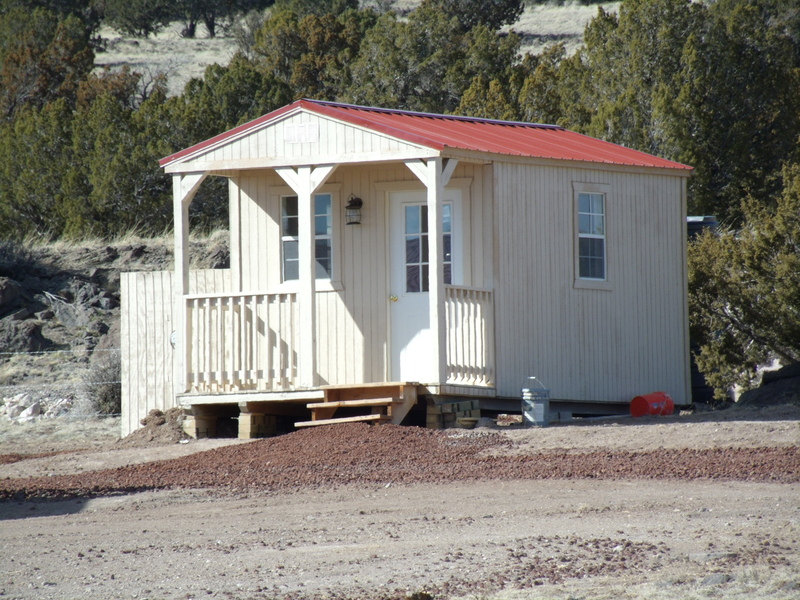 Next start construction of the dwelling, all while living in the trailer. Of course if disaster strikes, you can certainly accelerate your move. Some folks have bought their land but keep their trailer in a local storage lot when they are not living in it. This can reduce the theft/breakage factor while the unit is not in use. A few even rent storage units and pull the trailer inside. They store backup supplies of food, clothing, ammo, etc in the unit alongside the trailer. When it’s time to execute their survival plan, they just hitch up, load up, and hit the trail. Others leave their trailer on their property, but in plain view to counter thieves. 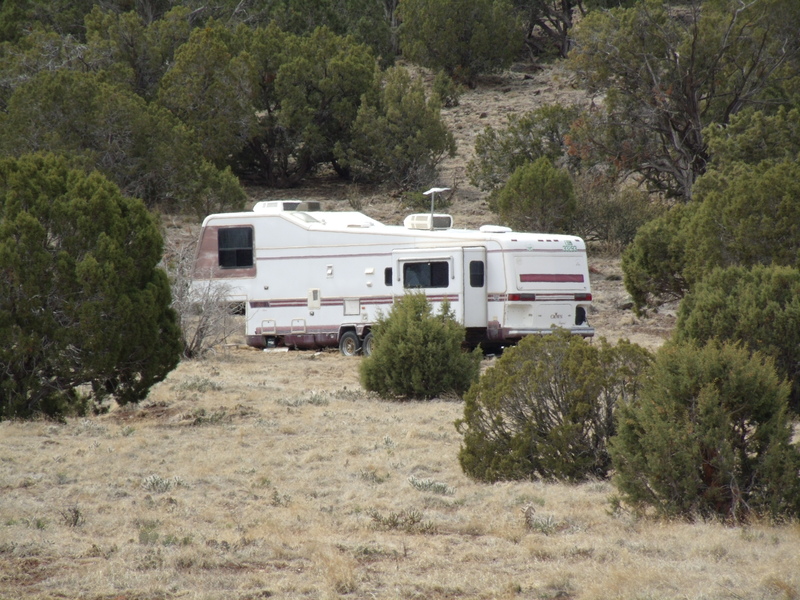 When they decide to move in, they tow the trailer to a more concealed portion of the land to keep a low profile. Shed fully installed, built-out and ready for use. In all cases, the keys are thinking through the potential events and planning ahead. Whether it is moving permanently to the country; buying land for a park unit, cabin, shed, or trailer; or planning to be nomads in your travel trailer, start planning and acting now! Whatever your personal trigger point, it will be too late to start planning when the flood/fire/storm/rioting hits. Think back to Hurricane Katrina for some depressing lessons about what happens to those who fail to plan and/or wait too long. Make some trips to the country, see what is available, and act to protect yourself and your family before events take control. Seth Nadel retired after serving 27 years as a Senior Special Agent with U.S. Customs. He was a firearms instructor for 25 years, including nine years as the lead firearms instructor at the Tucson Customs Academy.